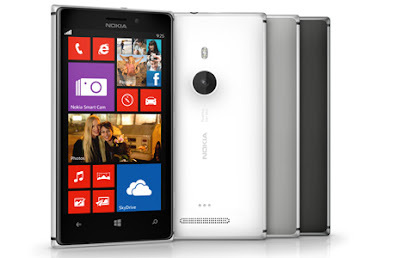 Nokia Lumia 925 now available in India for ₹34,169 (INR) / $539 (USD) / €403 (EUR). Powered by Windows Phone 8 OS from Microsoft, the Nokia Lumia 925 comes packed with great smartphone features. You can work on the go with Microsoft Office, enjoy free music on Nokia Music and discover the city around you with HERE Maps, or snap on a wireless charging cover to charge up without plugging in. ﻿When it comes to specifications, the Lumia 925 features 4.5" AMOLED super-sensitive touch screen at 600 Nits, NFC (optional), Dual-core 1.5 GHz Qualcomm Snapdragon S4 processor, 1GB RAM, 2000 mAh battery, 8.7 Megapixel PureView camera with six Carl Zeiss lenses, 1.2 MP wide-angle front camera.